It’s official. We have launched. No, not the boat — by my pictures it’s pretty obvious that’s going to take a bit more time. 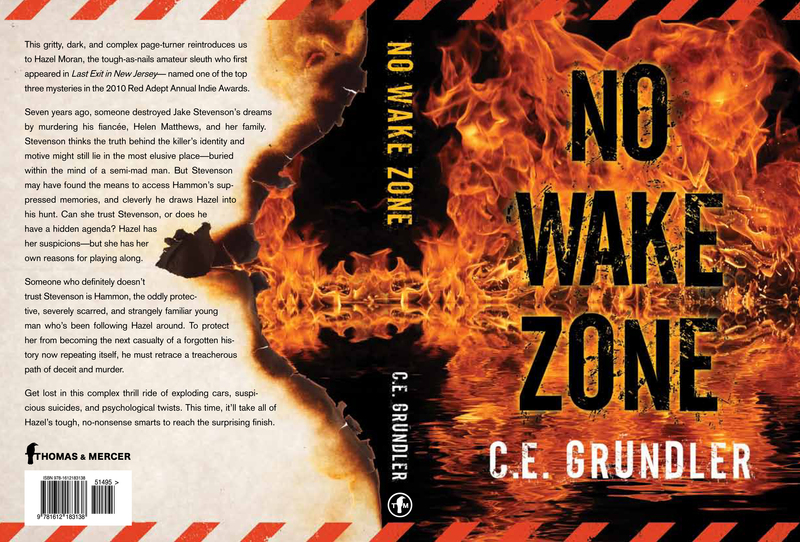 But today is the release date for No Wake Zone. 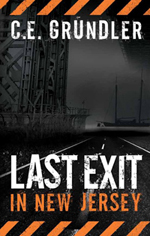 So, for all of you who read Last Exit in New Jersey and have been patiently waiting to learn what’s next for Hazel, Hammon, Annabel, and Stevenson, here’s your chance. 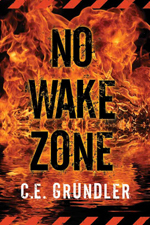 Happy reading, everyone! Last week was a rough one that blindsided me, and home feels a lot emptier for it, but I’ve been dealing by lavishing attention onto the other four-footed residents and by keeping busy. 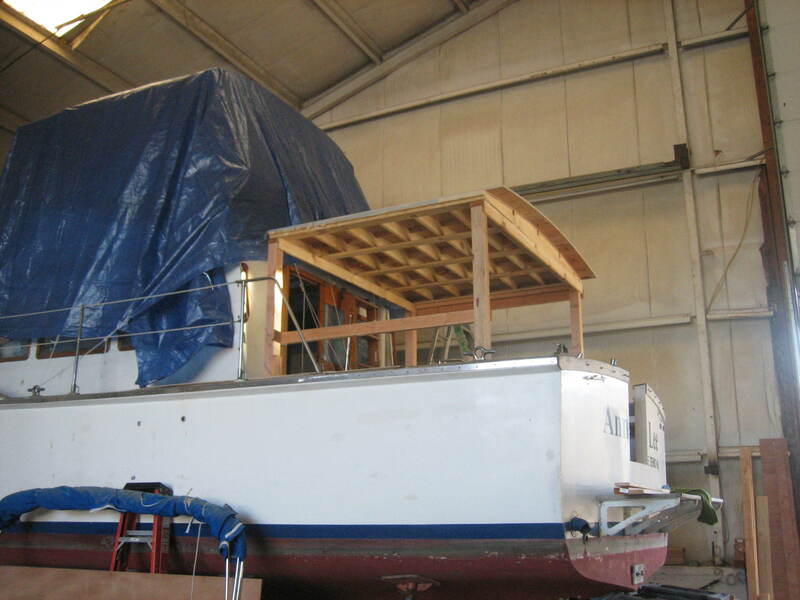 And keeping busy at this time of year means boat work, in this case in the form of the salon ceiling/bridge deck, which is at long last securely in place. 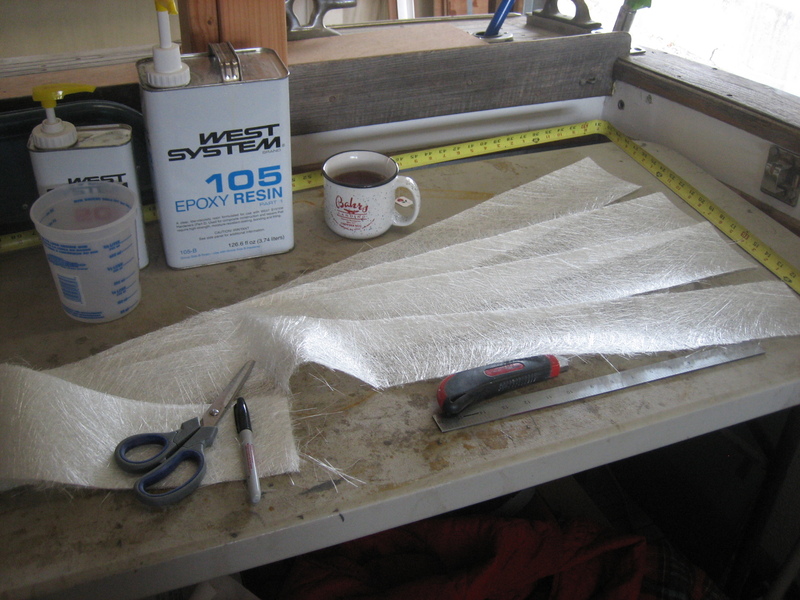 When last I left off, we’d been prepping out the areas where the edges would join. 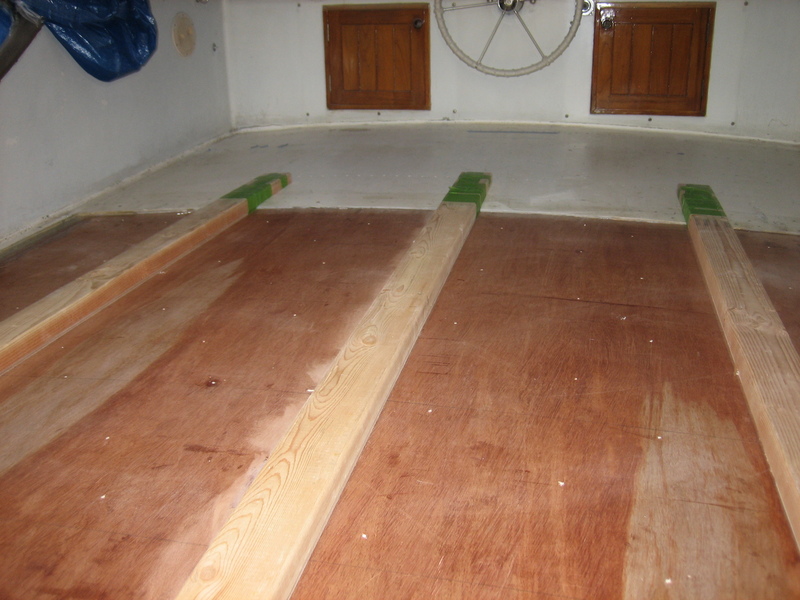 This included the forward edge of the remaining deck, the salon bulkheads and underside of the bridge. 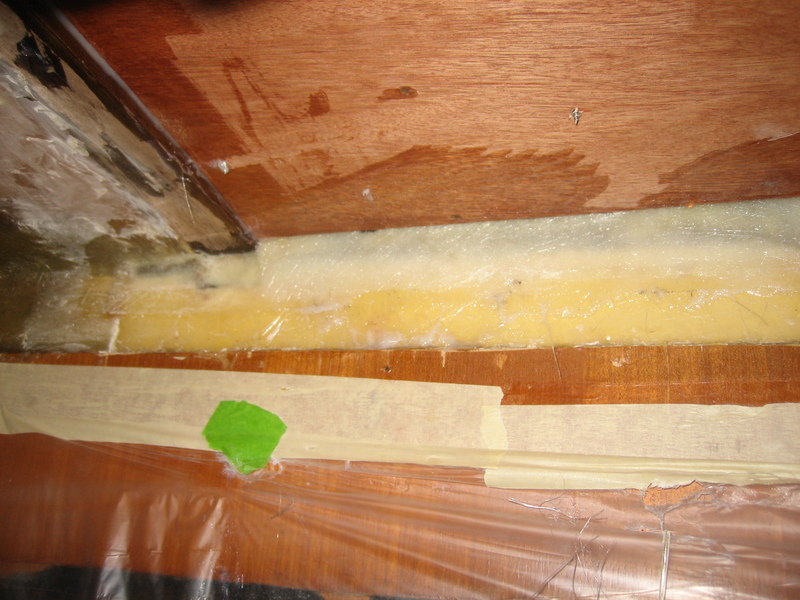 Think of it like a layer cake – one where the upper and lower layers are fixed in place, and the inner layer (the new laminate core) would be *very* carefully slide in between. 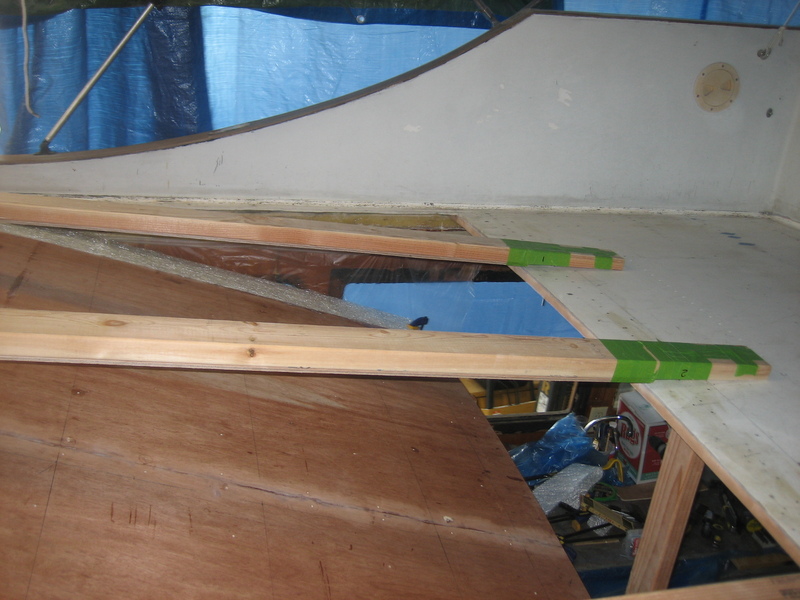 Only this layer measures approximately 8’ x 8’, weighs I can only imagine how much, has a camber to match the original curves and exact dimensions of the opening with only millimeters to spare and would be eased in by two people, (one of which is only 5’2”.) 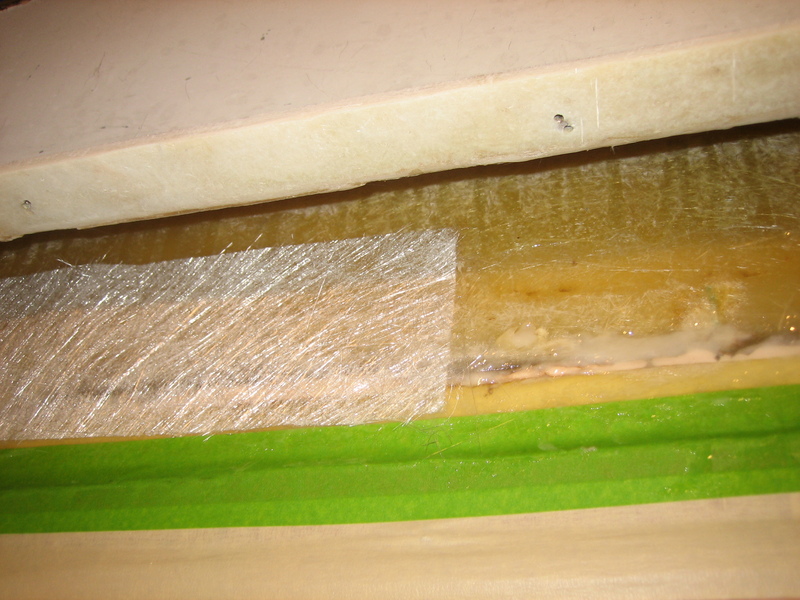 Add into this equation that every edge, inner and outer, upper and lower, needed to be prepped in epoxy, and upon alignment, lagged into place before that epoxy set. In other words, there was zero margin for error. Below: The Gazebo with the core on top — this made things much easier. The key to pulling this off was tons of preparation and planning, repeated ‘dry-fit’ test runs, and everything coming together just right. We had everything in place. 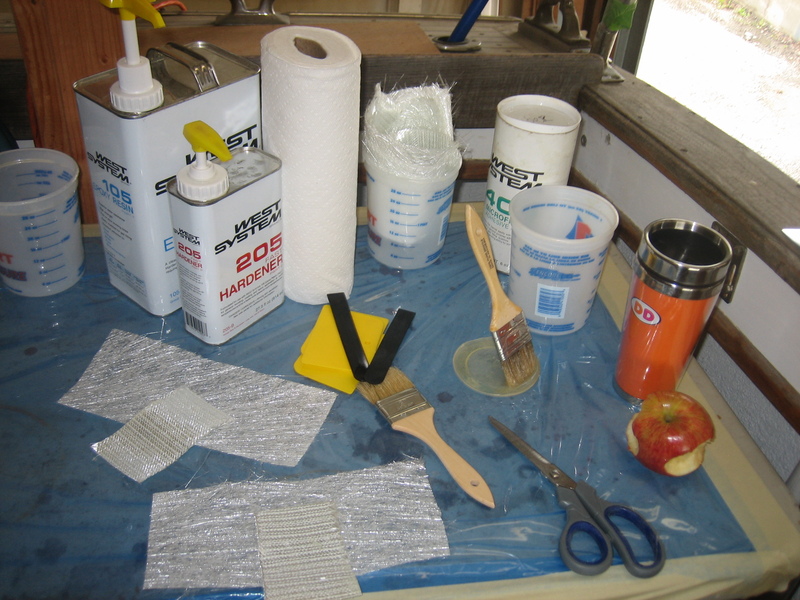 Resins, mixing pots and spreaders, fiberglass, brushes, hardware, tools, clamps, stands to support the wood, braces for alignment, etc. 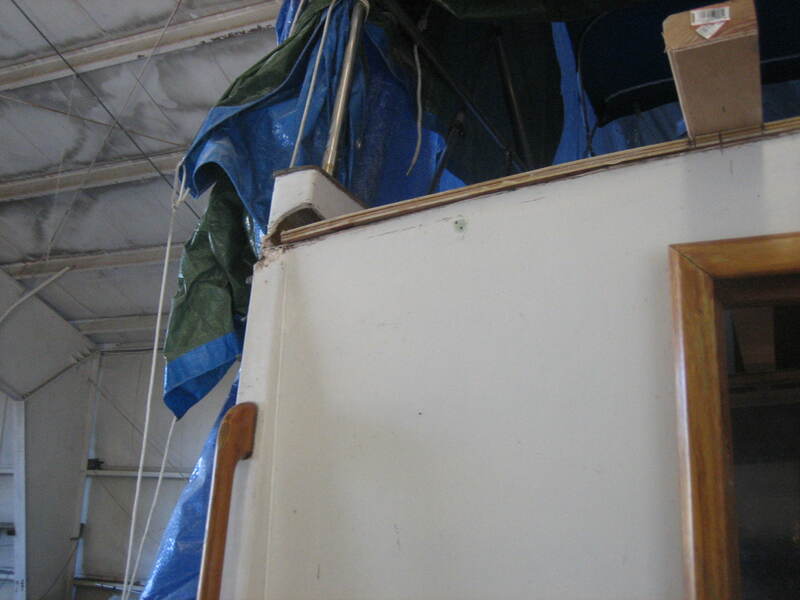 With the frame we’d used to originally laminate the wood set up on legs and looking like a gazebo in the cockpit, it supported the core at the right height and allowed us to slide it smoothly into the cabin. Below: the view from the cockpit. This extends slightly further than the original bridge, which will provide more space above and more protection to the cockpit door below. 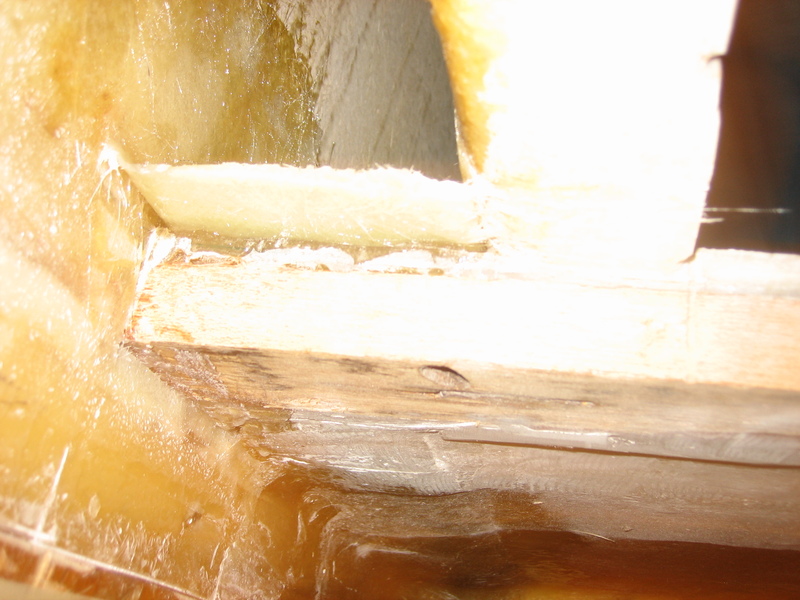 Once inside, we angled it down, braced it, wet out all areas that would meet with West System epoxy. We eased strips of pre-cut chop strand mat up from beneath where they would extend down, and smoothed the upper halves of these strips onto the top edges of the core. 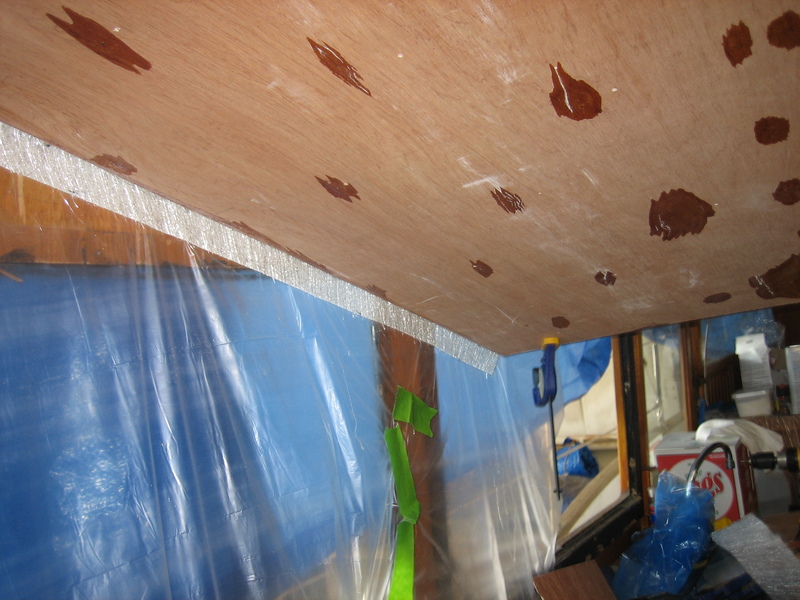 Next, we quickly spread West, thickened to a peanut butter consistency with 406 filler, along the salon bulkheads and bridge underside. 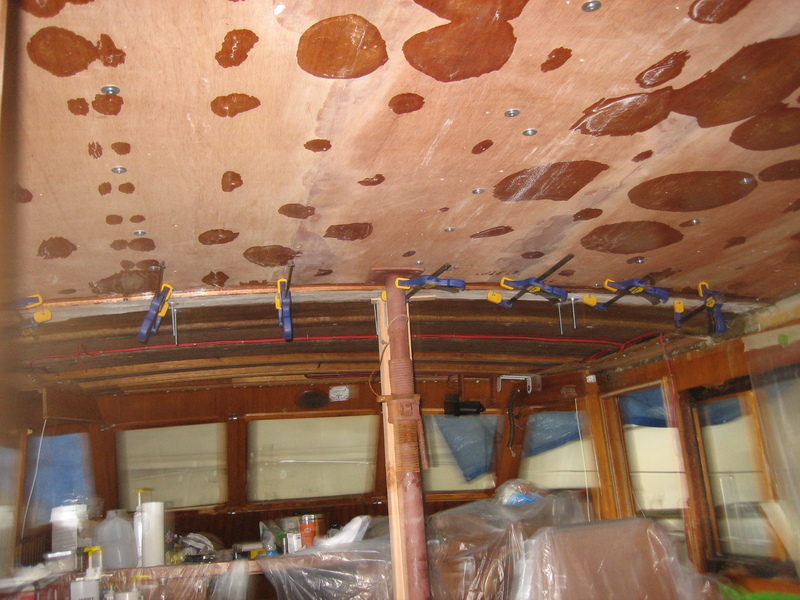 At this point I wasn’t taking pictures, as we were racing to cover large areas and get everything in place before the epoxy began to cure. That, and were I to pick up my camera it would likely still be covered in resin. Once everything was wetted out the core was raised into final position and screws went in to set it into position, joining it to the leading edge with clamps, the bridge, and temporary 2’x4’s shimmed and angled to match the final alignment. And there you have it. 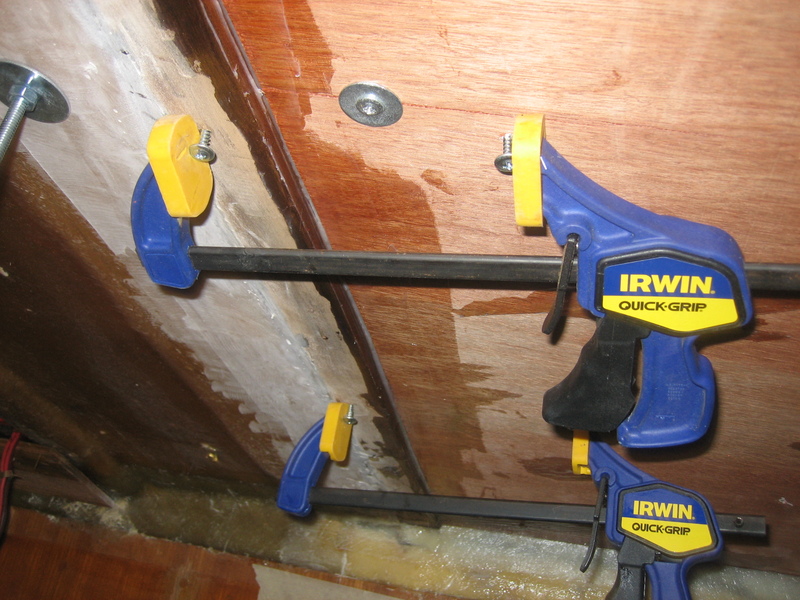 Next round, screws out and we’ll be laminating ribs in. 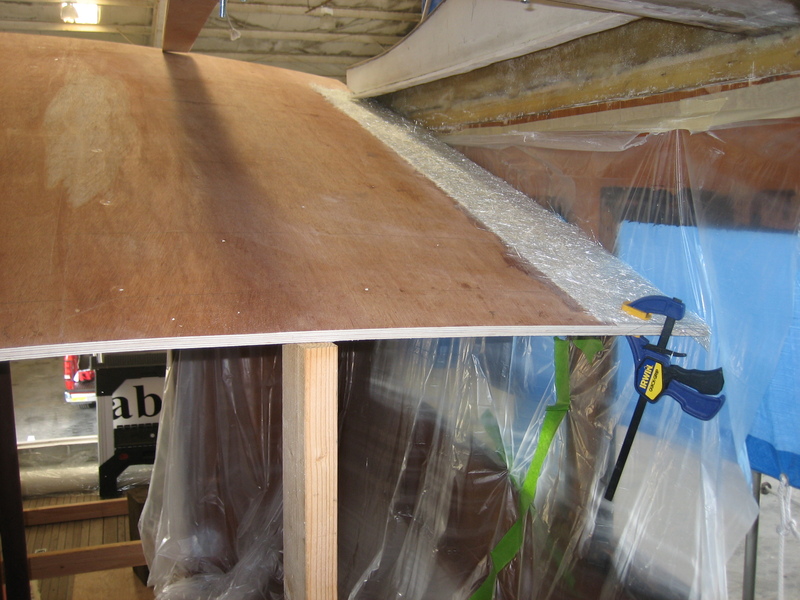 After that, we’ll re-glass the underside, then go above, fill all the screw holes with epoxy, and glass the bridge deck. It’s been a sad time here and everything feels so much emptier since Moxie passed away on Tuesday night. She’d had a good, long life, and at sixteen she was still going strong, if somewhat unsteady on her feet, but still determined to take on full flights of stairs and short walks. We knew things were failing internally, but her spirit was still strong, along with her attitude and appetite… until the other night. Thankfully it all happened within a short time; that morning she’d been perfectly fine, and we’d been told things would be sudden and fast. We could see she was shutting down, letting go, and while that was probably the best way for things to end. Still, it doesn’t hurt any less and it will take time to come to terms with her passing. Our gratitude goes out to the staff at Oradell Animal Hospital for their compassionate understanding and gentle help, letting her pass away with her family at her side, and even for placing her in a pet sized sturdy cardboard ‘casket’ for us rather than a black plastic trash bag. The clay paw print someone there made for us was unexpected and will be treasured. 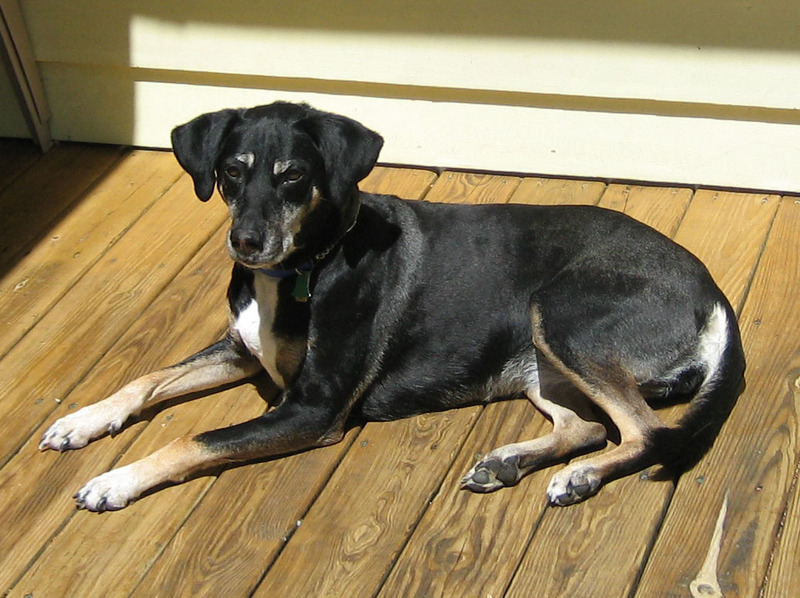 I’m also grateful to Anthony Erekat at Faithful Companion in Clifton, NJ, who handled Moxie’s cremation. Located in a separate portion of a tasteful funeral home, Faithful Companion offers the same services for pets with the same dignity you would expect for any family member, and that brought us more comfort we truly needed. 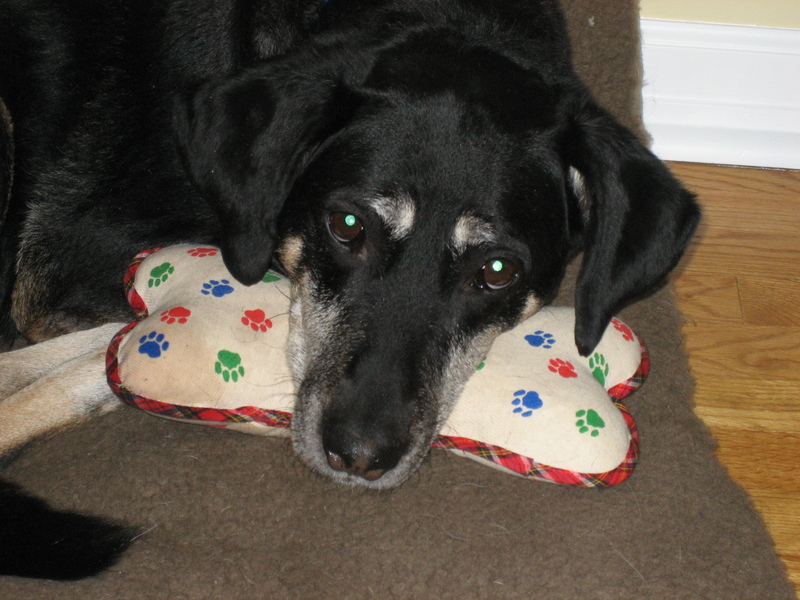 I know in my heart Moxie had a good life, long and happy, and she was loved dearly. I know in time this will sting less, but right now our home feels like something essential is missing. Loki and Rex still keep looking for her, they don’t understand where their leader has gone and they have a bit of a lost look as they come to understand they don’t have her lead to follow anymore. We’ll all adjust, but it will take time. Technically, not just with, but actually bonding the boat. When she was first constructed, the bridge was set down after the salon was completed. Seems logical and makes sense. 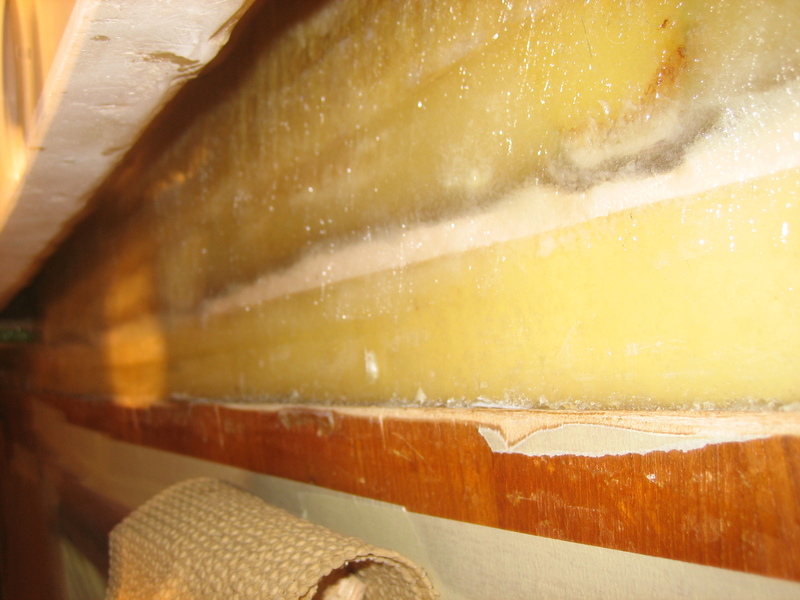 However, once we’d removed the saturated salon overhead/bridge deck coring, all that held those regions together was a small bit of filler, much of which had separated. 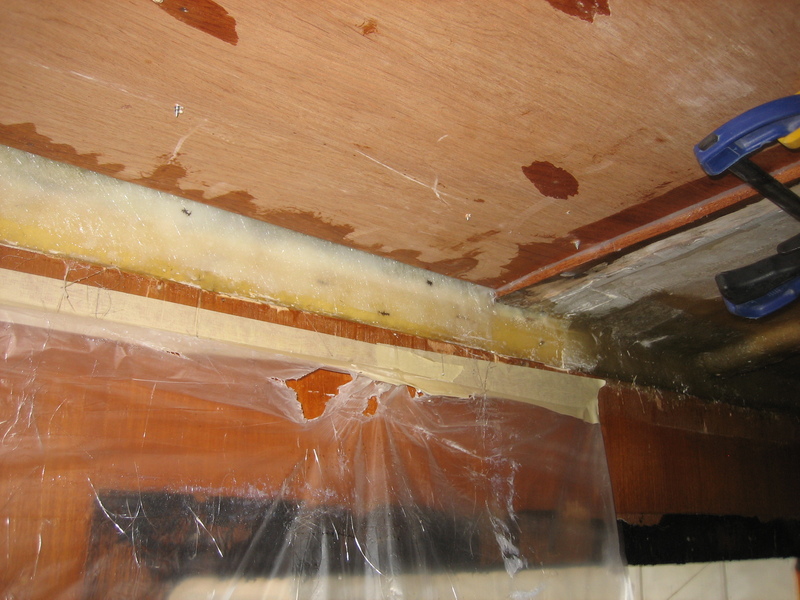 Needless to say, once water found its way in, it was easy to see why this was yet another source of leaks over the years. Both areas are quite solid and strong, but there is little holding them together. Here’s a closer look at particularly bad spot. 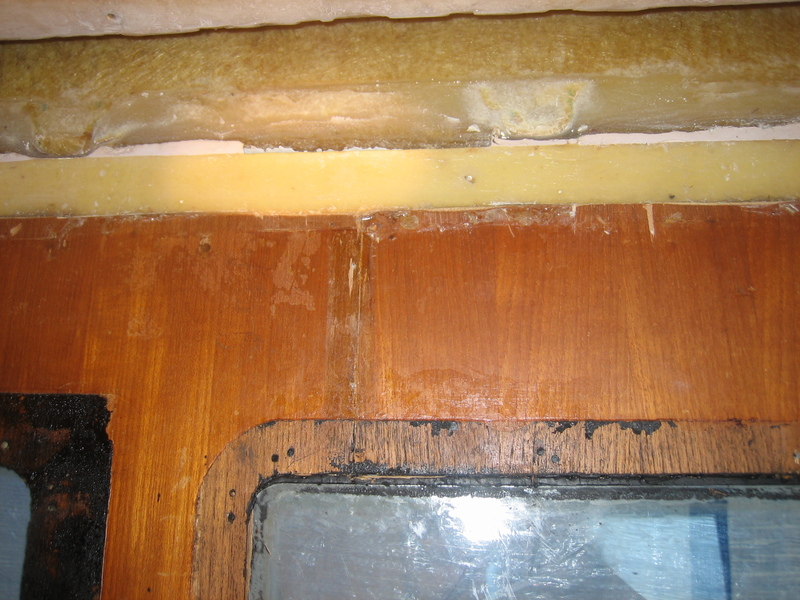 Being that this particular joint is the same location where the new core will rejoin the cabin, some reinforcement were in order. We prepped the area, and yesterday I first wet it out with some West System, then filled and faired all gaps and voids. 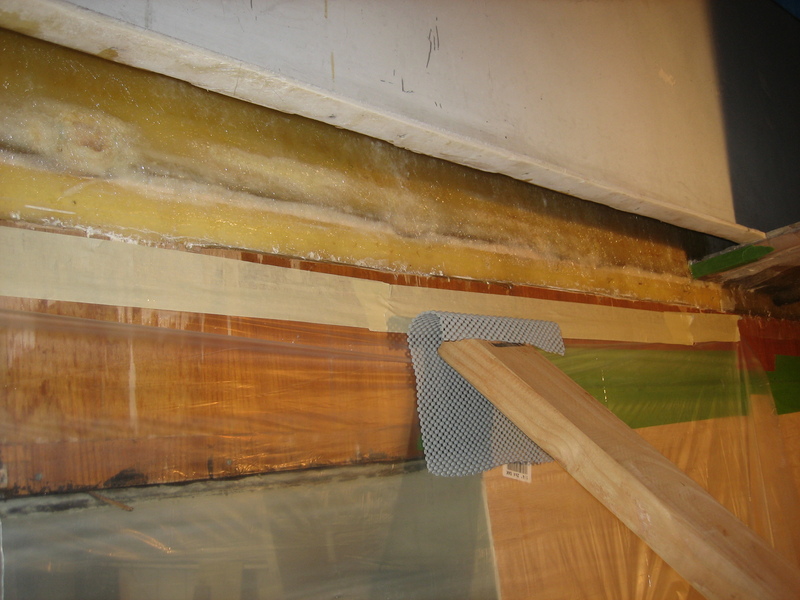 I’d cut strips of fiberglass mat and laid them over these areas, creating a smooth bond between the salon and bridge. Today, a bit of wet-sanding before the epoxy fully cures, and I’m going to mold in a small ledge in either forward corner to give the new core that much more to bond against when it goes in. This small but critical step may not look like much, in fact once the glass was wetted out it’s almost impossible to see, but this represents a key turning point. This round of destruction has rounded the bend. Things are now going back together. 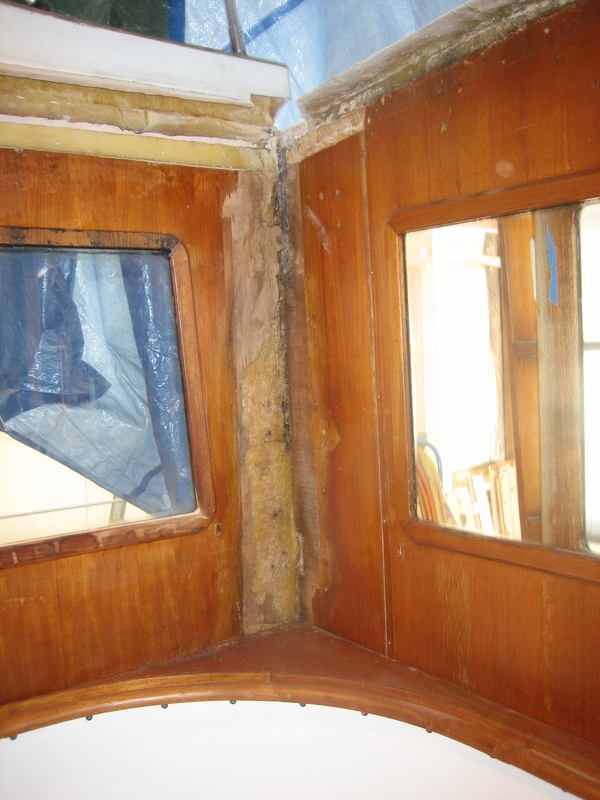 This coming weekend, with some willing volunteers on hand to assist, the cabin should once again be solid and bonded on all corners. It will take a few more weeks before everything is structurally reinforced and glassed into place, but we’re getting there. 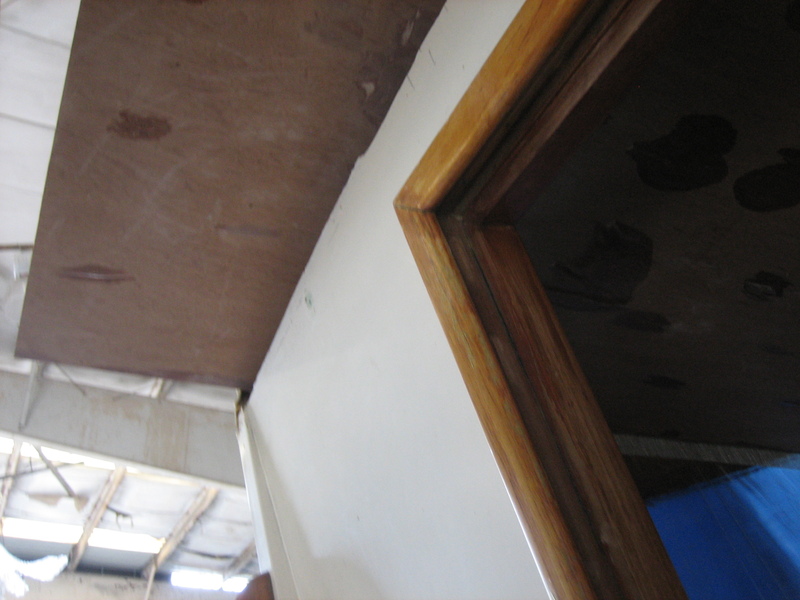 And once that’s done, THEN we can focus on removing and resealing the salon windows as well as (first) replacing all the damaged wood covering the salon interior bulkheads. Fortunately that is a 1/8″ laminate, so that shouldn’t hit the budget too hard, and with that done, she’ll start to look the way she should… on the inside, at least! The weather’s looking great for the weekend, so the plans are to pack a cooler with some nice steaks, and once the main work is done we’ll be firing up one of the grills the boatyard has by the river’s edge. It’ll definitely be a celebration, and one thing that makes boat work that much nicer is a bit of fine dining. Hmmm. Maybe I should pack a laundry bag… but I wouldn’t want to scare anyone.